Temperature refers to the degree of heat or cold in an object or a human body. In humans, the brain’s hypothalamus acts as the body’s thermostat and is responsible for regulating its temperature (OER #2). 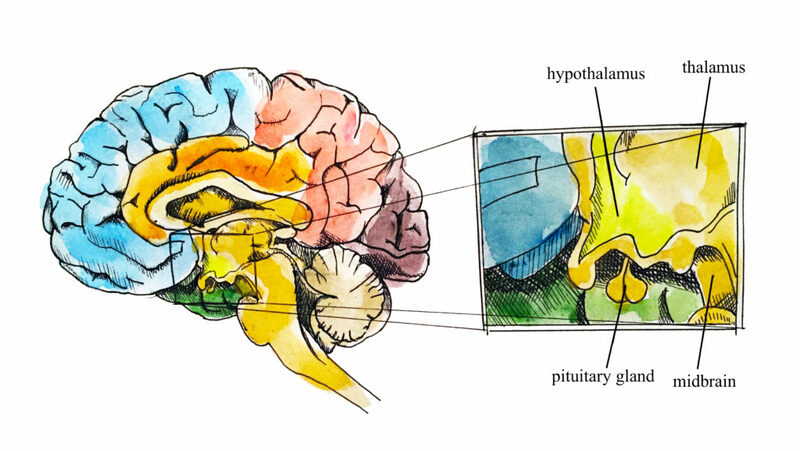 See Figure 2.1 of the hypothalamus. The human body is constantly adapting to internal health states and environmental conditions, and the hypothalamus is programmed to tell the body to generate heat if the body temperature is low. For example, the hypothalamus can activate peripheral vasoconstriction and shivering (contraction of skeletal muscles) to prevent a decrease in body temperature. The hypothalamus can also reduce heat if the body temperature is too high. For example, it can activate peripheral vasodilation to increase heat loss and cause a person to perspire, which cools the body. Next: Why is Temperature Measured? What is Temperature? by Ryerson University is licensed under a Creative Commons Attribution 4.0 International License, except where otherwise noted.